This new deal will see further expansion across 16 new country markets. This follows three years of digital out of home deployments in the UK market where the total DOOH revenue now represents 50% of all OOH revenues. The soon to launch, standardised double sided 75” screen product will offer Clear Channel International’s business units more efficient deployments across roadside, bus-shelter and outdoor retail environments. The displays have been developed to create base-product standardisation while also providing the opportunity for exterior customisations for the local market’s specific needs. This new product will benefit from a range of new innovations and investments that are all aligned to ensure shorter lead times and reliability on the street. Amscreen are specialists in delivering connected advertising displays across Europe. With a network of 15,000 screens and more than 20 years’ experience in providing full end to end suite screen solutions, Amscreen are Europe’s No.1 digital solutions provider and innovator. The current partner portfolio includes blue chip retail businesses such as BP, Shell, Tesco and Costa Coffee as well as Clear Channel International. 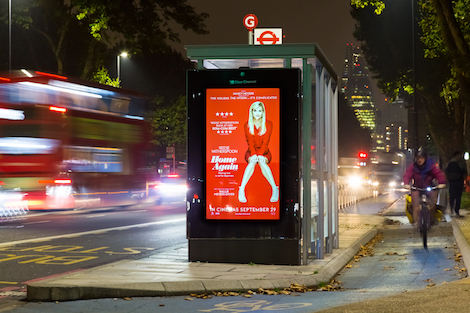 A deal in 2016 saw Amscreen provide Clear Channel UK with their award-winning phone kiosks – a reimagination of the iconic British red phone box. Amscreen has also supplied and shipped more than 2,000 freestanding and bus shelter units to further bolster Clear Channel’s national digital Adshel estate. Recent investment includes a 20,000 sq. ft. European based manufacturing facility (see video) as well as a real-time remote device monitoring platform RDM® for remote management and maintenance of a screen network. This entry was posted on Thursday, October 19th, 2017 at 13:45 @614 and is filed under DailyDOOH Update. You can follow any responses to this entry through the RSS 2.0 feed. You can leave a response, or trackback from your own site.